the portico’s short side, which suggests that the main entrance was once directly from the Forum. This hypothesis is confirmed by the fact the main facade of the altar at the bottom of the temple steps faces the Forum. The sacred area is surrounded by a portico with 48 Doric columns, in the centre of which, on a podium in the Italic style, is the actual temple. The cell originally contained a statue of a divinity (not found) and a rock of carved tuff representing the world’s navel, modelled on the one located in the famous sanctuary of Apollo in Delphi. At the bottom of the temple is an altar in Greek Marble dedicated shortly after 80 A.C. by Marcus Portius, Lucius Sestilius, Cneus Cornelius and Aulus Cornelius, quattuorviri of Pompeii. At the top of the Ionic column to the left of the stairway there once was a meridian (sun dial), which the duumviri Lucius Sepunius Sandilianus and Marcus Erennius Epidianus commissioned. The two bronze statues inside the sacred precincts (Apollo with Bow to the right and Diana to the left) are copies of the originals (now in the National Museum of Naples) and datable to the late Hellenistic period. The temple of Apollo was also being restored at the time of the eruption. 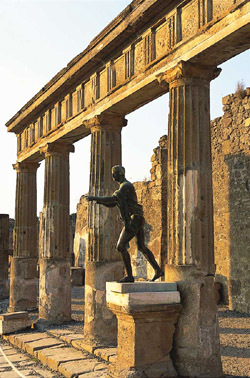 It is one of the oldest temples in the city, Apollo being the main divinity in early Pompeii.